Does it possible to explain MAC (minimum alveolar concentration) of inhaled anesthetics from molecular structure? The minimum alveolar concentration is one of the index to count inhaled anesthetics strength of anesthesia. Do it yourself (DIY): It was found that the solubility parameter has played a surprisingly large role to estimate MAC. This treatment is not only the position in three-dimensional space of Hansen parameters, but it is necessary to use the results of YMB calculations. So, I will explain in the DIY corner. Try it by yourself! Inhalation agents (inhaled anesthetics) are absorbed from the lungs and excretion is very early, so they are widely used. Once, ether, laughing gas (N2O), Halothane were used. To evaluate of the strength of these inhalation anesthetic, MAC (minimum alveolar concentration) is used. MAC is the lung inhalation anesthetic concentration that 50% of patients do not show any response to skin stimulation. The effects of inhalation anesthetics is stronger MAC is small. Partition coefficient blood/gases is the ratio of the concentration of inhalation anesthetic in the blood on the concentration of inhaled anesthetics has reached a state of equilibrium. This is the indicator of recovery from anesthesia with the introduction of inhaled anesthetics. Ether is a flammable, take a long time to deployment and awakening, and now is not used. Laughing gas is a colorless and odorless gas, soluble in water. Analgesic action is strong, so weak anesthetic action by itself. Laughing gas is not used now. Halothane is a volatile anesthetic and not flammable. Anesthetic action is quite strong. Analgesic, muscle relaxant effect is so weak, that combination of muscle relaxants and nitrous. Because there is a vasodilatory and myocardial depressant effect, easy to drop in blood pressure. Because it enhances the adrenaline sensitivity of myocardial conduction system, arrhythmia-prone. In some cases, may cause liver dysfunction or malignant hyperthermia. There is little isoflurane myocardial depression. Liver failure is low because they are not metabolized in the body. introduced from halothane, arousal is faster. Has the effect of an increase in cerebral blood flow. There is a dose-dependent respiratory depressant effect. Sevoflurane has been used most often in our country. Fast to deploy and arousal. There is a dose-dependent respiratory depressant effect. There is a strong analgesic effect. Is degraded by soda lime adsorbent and Bararaimu CO2, occurs in compound A nephrotoxicity. I found one interesting literature that summarize MAC of inhaled anesthetics. For more information please read the above literature. I summarized the molecules below table. 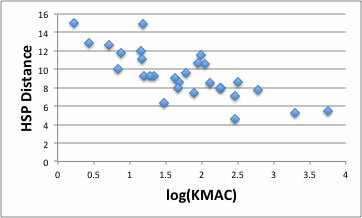 At first, I checked the rough correlation log(KMAC) with physical properties of each compound. 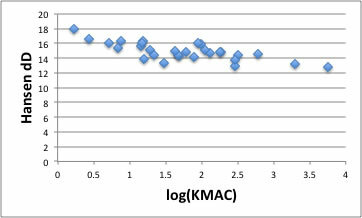 For example, I made the graph log(KMAC) to boiling point of compounds. There is some tendency between log(KMAC) and boiling point. 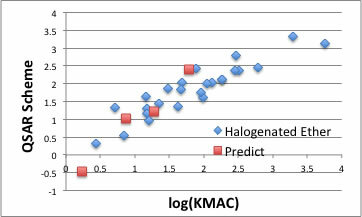 If I assignd log(KMAC)<2.0 as strong inhaled anesthetics, then boiling point range of 292K-375K compounds are the answer. We can easily know this result is strange. Because almost all common solvents are in this range. Then what other additional factors determin anesthesia strength? 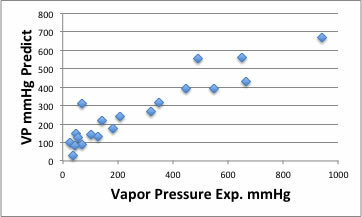 One factor is Hansen solubility parameters, dD (dispersion term) as show below graph. 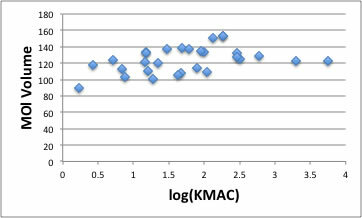 If I assignd log(KMAC)<2.0 as strong inhaled anesthetics, then the value of dD is between 13.3-18. In addition, molecular volume is very important. If I assignd log(KMAC)<2.0 as strong inhaled anesthetics, then the adequate molecular volume is 90-140. 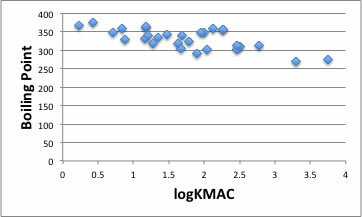 Then I made QSAR model that estimate log(KMAC) from boiling point, dD and molecular volume. I show the result below. When I made this scheme, I use only halogenated ether data (Blue diamond), and using this scheme, I predict diethyl ether, Halothane, Sevoflurane, Trichloroethylene (Red square). The result is fairly good. Then I search HSPiP database with the condition 292K<boiling point<375K, 13.3< dD < 18, 90< molecular volume <140. HSPiP data base have over 10,000 compounds but there is only 373 compounds that meat this ranges. Why there are so few molecules that meat this range? Larger boling point and smaller molecular volume is completely confricted. Halogenated compounds that include Cl atom or Br, are selected because Cl or Br atom size are not so large but they increase dD and Boiling point. F atom adjust volume, dD and boiling point. If we have the experimental boiling point for these compounds, the YMB calculation will increase accuracy. These anesthetics are absorbed from the lungs, absorbed into blood then circulate over the body. I am just the Polymer Chemist and do not know how these chemicals work in body, but if delivered anesthetics dissolve into the nerve to act, then solubility to nerve become very important. HSPiP have he function to determine HSP of target that absorb anesthetics. The basic concept of this thought is “likes dissolve likes”. When we say “likes” we means “the HSP vector similarity”. We calculate vectors similarity with next scheme. If we apply Sphere Calc. Data that implemented in Sphere GA search, program will determine Target HSP as [12.9, 3.1, 2.3]. The CCIF2OCFHCF3 is shortest HSP distance. What is this region? They made adamantane that have 3 fluorine atoms in R2-R4 position. They calmed this fluorinated adamantane deliver drugs into central nervous system (CNS) of patients who suffer Alzheimer's or Parkinson's disease. So I try to calculate HSP of fluorinated adamantane with YMB function. The fluorinated adamantane’s HSP become [13.9, 0, 3.2] . This HSP is very similar to CCIF2OCFHCF3 [12.9, 3.1, 2.3] or CF3OCFHCF3 [13.2, 3.3, 2.7]. 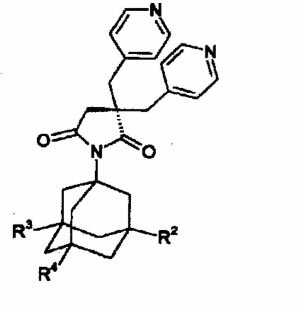 Is there anyone who want to make the drug attached these structure instead of fluorinated adamantane? 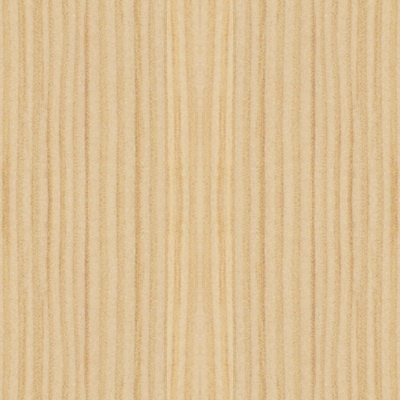 Let's see these materials in the Hansen 3D space. If you are using HTML5 enable browser such as Chrome or Safari,FireFox4 (IE9 have problems), you can see the Canvas. Drag=Rotate, Drag+Shift key=Mag/Red, Drag+alt key(option key for Mac)=Translate. If you pick solvent, solvent name will appear. Green Large sphere show CNS, Cyan large Sphere show fluorinated adamantane. Red small spheres show haloganate ethers and Blue small spheres show traditional anesthetics. The other day, I read newspaper that said Alzheimer's disease start some protein dissolve nerve and spread whole nerves. If this protein’s HSP is near to [12.9, 3.1, 2.3], what we can do? In electrone beam etching field, they made adamanatane attached (Meth)acrylate as regist polymer, If we made fluorine modefied adamanatane poly-(meth)acrylate, this polymer catch this protein instead of nerve like oil absorbent paper? 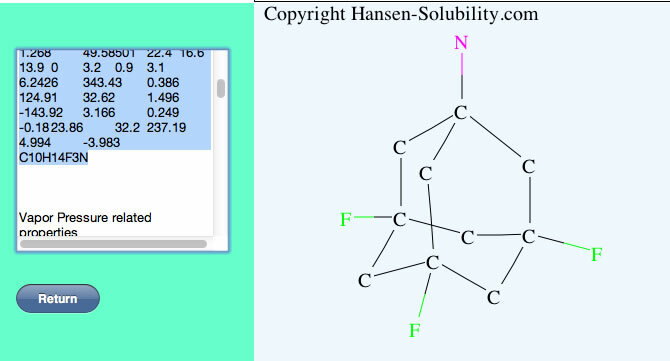 I searched HSPiP database with the condition of 12.0 <dD <14, dP <4, dH is <4 Boiling Point> 350K, only 69 compounds exist. These chemicals also become good lead compound I think.